Dill is a herb which has a long history of use both medicinally and culinary, its associations with both witchcraft and the bible indicate its diversity of use. Dill (Anethum graveolens), a member of the Umbelliferae plant family, derives its name from the Norse dilla meaning to soothe or to lull. It was a herb which the ancient Egyptians used for medicinal purposes and it is recorded in the Ebers Papyrus as an ingredient for a pain killing mixture of that time. Both the ancient Romans and the Greeks were users of dill, the Romans called it anethum which later became known as anise. The Greeks believed dill helped with sleep and hiccups. Dill also receives a mention in the Bible with reference to its value as a tax payment. In Scandinavia and Germany dill was used in cooking in fish and cucumber and its seeds were baked in bread. Throughout the Middle Ages, dill was used as a protection against witches. Magically, dill was used in spells and used to promote romance, when combined with wine. The Pioneer settlers of North America gave their children dill seed to chew throughout long sermons in church, where dill earned the nickname meetin' seed. In both the West and the East, dill was used as a digestive aid for help with wind, colic and indigestion and is still current in the British Herbal Pharmacopoeia for this use. It was especially known for its use with children and babies; dilly pillows, made from lavender and dill, helped to lull European children to sleep with their fragrance. Today, dill is used in grippe water for babies. Native to the Mediterranean region, dill is an annual or biennial herb which grows up to three feet high. It has small, aromatic yellow flowers which are arranged in clusters; it blooms in midsummer. Dill's feathery leaves are also aromatic and are blue green in color. It usually has one main stem which is also blue green. Dill's seeds are aromatic and contain mineral salts, calcium, silicic acid and phosphorus. Dill is now cultivated worldwide. Culinary ... the leaf, seed, and flower are used to flavor soups, meat and fish dishes, cakes and breads; known for its use in pickles and condiments. Cosmetic... the seeds of dill are chewed to freshen breath; used as a fragrance component in perfumes, soaps and detergents. Aromatic... dill is used in aromatherapy as an essential oil, useful for help with a number of ailments, especially digestive difficulties, but also used with nursing mothers to promote the flow of milk. Medicinal... dill is rich in mineral salts and can help with a salt-free diet. Dill water is a popular pharmaceutical digestive preparation. Cut hard boiled eggs in halve, place yolks in a bowl. Using a fork, mash egg yolks. Add light mayo, dill, salt and pepper, mix well. Dice your egg whites. Fold dice egg whites into yolk mixture. Serve egg salad on bread. Enjoy! If you leave a comment and ask me a question, please come back to get your answer. I will answer all questions. I read all comments and emails. Thanks and hope y'all have a great week. I used to have egg salad sandwich in New York but I didn't know how to make it. I'm going to make this for my daughter, today I bought a loaf of wholegrain bread from NaturaSì, perfect for it. What is dill in Italian? Following you from Rome! It's amazing how so many culinary herbs have medicinal uses too. I always put dill in my egg salad. I've never used dill in an egg sandwich. I'll have to try that next time. I did however make a dill ranch dip last week that disappeared in no time at all. So, I bet we'd like it with the eggs. thanks! Egg salad was the classic trip sandwich filling when I was a child. My mom made up a batch and put it in the cooler so that we could eat it half way to our destination. Brings back memories. Your question: What is dill in Italian? Awesome info, thanks for sharing! 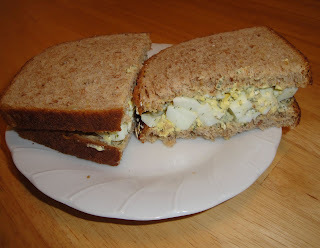 I love egg salad sandwich, great recipe for sure! wow that looks healthy and yumm!!! !can you link to the event in my blog? Egg salad is a classic! My husband loves them, and I make them for him often. I am not a fan of eggs or mayo, so I won't touch it. But interesting reading about it - thanks! Love dill. I've planted dill in my backyard and uses them often on fish. Very creative way to use dill with egg sandwich. Love it! One of my favorite sandwiches... Your version sounds very yummy, Christine! I love food history! I'll remember reading this as I bring some more dill in from my garden. Please stop by Sprigs of Rosemary to pick up an award -- and pass it on if you'd like! You have a very interesting blog! I've never used dill in an egg salad sandwich - I bet it's great! I got a chuckle that it was used to ward off witches! All I could see was folks running around with dill necklaces! Hi Rosemary, thank you so much! I'm very happy to receive the award. Thanks again. I've never used dill on egg salad and I love egg salad. Thanks for the idea! Hi Ann, I also giggle when I saw that. Egg salad sandwiches are a comfort food to me and remind me of childhood lunches. The addition of dill sounds good-thanks for sharing. There's nothing quite like a fantastic egg salad sandwich. I think I'm going to have to encourage myself to like dill as it has far too many good qualities! But in all honesty a good egg sandwich is only complete for me with a handful of cress added. Sometimes it's the simplest meals that are the most satisfying. Thank you for the reminder. That looks and sounds good, thanks for sharing. Next time I will add dill to mine. Thanks for sharing. thank you for such wondeful info on dill, love learning about the herbs we use in our kitchen!! ANETO!! !Yes, now I remember. Thank you Christine! I always put fresh dill in my egg salad - and chopped olives! It just brightens the eggs! Easy to make, delicious in taste! I haven't had one of these in YEARS! We call dill anis. The dried one is used for soups, haven't seen the normal one though. But that's one good sandwich, breakfast or merienda, I'll surely love it. While I never developed a taste for dill pickles, dill does add a lovely element to egg salad. I would never have thought to put dill in my egg salad sandwich but I just may give it a try.